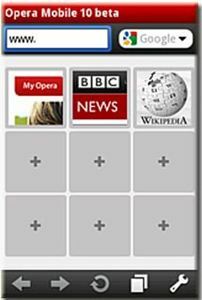 Opera Software has unveiled its Opera Mobile 10 beta for Nokia and other Symbian/S60 handsets. One of the notable features in the new Opera Mobile 10 beta is its sleek design which was first introduced to the world in the recent release of Opera Mini 5 beta. The Opera Mobile 10 beta has revamped the look and feel of its mobile-browser portfolio to ensure that it is simple and intuitive for enhancing the mobile Web browsing experience. The new look introduces the Speed Dial, tabbed browsing and convenient password manager that make it easier for users to surf while on the go. According to the press, the Opera Mobile 10 beta is able to provide up to twice as fast as the previous version of Opera Mobile especially when downloading pages, zooming and panning. In addition, the Opera Mobile 10 beta is also integrated with Opera Turbo that able to save the end users time and money with its server-side compression technology. Opera Mobile 10 beta is available for Nokia, Sony Ericsson and Samsung smartphones which running on Symbian/S60, 3rd and 5th editions. The Opera Mobile 10 beta is available for free download to install from desktop or directly from m.opera.com/mobile by using mobile phone default Web browser. Nokia – E51, E52, E55, E63, E66, E71, E75, N78, N79, N81, N82, N85, N86, N95 8GB, N96, N97, 5320, 5630, 5800, 6220c and 6720c. Samsung – Samsung i7110, Samsung i550, Samsung Omnia HD and Samsung Innov8. Sony Ericsson – Sony Ericsson Satio.